The first time I saw the Pixar film Inside Out, I had to hold back an all-out convulsive sob. My 7-year-old son, whose caring, sensitive soul constantly amazes me, looked up at me to see tears streaming down my face, and the pace of his own tears quickened. We saw the film a second time with my mother and 91-year-old grandmother, and four generations of tears flowed. The smartest and saddest movie Pixar has ever made, Inside Out comes to Blu-Ray Nov. 3 so you can cry with as many members of your family as you want in the comfort of your own home. The film takes place inside the mind of 11-year-old Riley, who learns to wrangle five personifications of her emotions—Joy, Sadness, Fear, Disgust, and Anger, while making the life-changing move from Minnesota to San Francisco. There could have been as many as 21 different emotions featured in the film, such as boredom, contempt and embarrassment that make up our emotional DNA. That’s the suggestion psychologists Paul Ekman and Dacher Keltner made when they first consulted on the film five years ago, when writers began the intricate task of developing human emotions as a cast of characters. Inside Out director Pete Docter was close to adding a sixth character—pride, an early press kit for Inside Out reveals. “Or Schadenfreude, who delighted in the pain of others. But it started getting crowded in there. We ultimately landed on five,” Docter says. So, would you be able to name your default emotion, or the temperament you feel most often? Most of us can’t, the psychologists Ekman and Keltner say. That’s what I find amazing about Inside Out—its ability to give us a tangible handle to describe our emotions—something that stays with viewers long after the film is over. Joy, voiced by Amy Poehler, is the bright-colored, glowing character inside Riley’s mind who measures her success by the number of happy days she can produce. In this line from the movie, Joy thinks that a good life is one that never experiences hardship, but her short-sightedness keeps her from realizing the benefit of other emotions, such as fear, disgust or anger. Thankfully, we know that a good life is not a perfect life absent of emotion. None of the other characters understand the purpose of Sadness, voiced by The Office’s Phyllis Smith, and with good reason—it seems Sadness simply slows down Joy’s desire for quick decisions and quick fixes. She is a sluggish, slumped-shouldered drag in a blue hue, who Joy has to literally drag around Riley’s mind. The film’s psychologists say in their New York Times op-ed they took issue with sadness’s portrayal because inside our minds, sadness is not a sluggish nuisance, but rather a physiological response that signals the body to respond (we cry). Though Sadness delivers this line as comic relief, she accurately describes what happens when we experience profound loss. We slow down, we process and we cry. Riley wants to be happy, just as her parents and any other 11-year-old girl thinks she should be, but she becomes overwhelmed with the different feelings she’s begun experiencing, including anger and disgust that masquerades as joy—the result, sarcasm. Unable to cope with her internal conflict, Riley loses interest in friends, activities and core personality traits that once made her happy and made her the person she is. This, of course, psychologists will say is a classic description of depression. But the one emotion that breaks through and reunites the pre-teen with her parents is sadness. Riley breaks down in tears in this scene, finally releasing all the emotion she’s bundled inside. This important line in the movie reveals sadness is a more powerful emotion than happiness. With regard to Inside Out‘s character development, Joy may be the most appealing and easiest character to like, but Sadness rises as the most important emotion of them all. Early in the movie, Riley’s mother praises her “brave and happy girl” for keeping a smile on her face through the family’s difficult transition. Unknowingly, Riley’s mother has suggested that happiness, or at least putting on a brave face to feign happiness, is the best way to cope. As the months go on and Riley struggles with the adjustment, she finds it harder to be happy like her parents want. But she didn’t need to force herself to be happy. She needed to be allowed to be sad. During this scene when Riley breaks down crying, she shares a formative moment with her parents, who finally realize they can’t take away the hurt for their daughter, but can show her it’s ok and normal to be sad. Of all the poignant messages that Inside Out delivers, this is the most important. 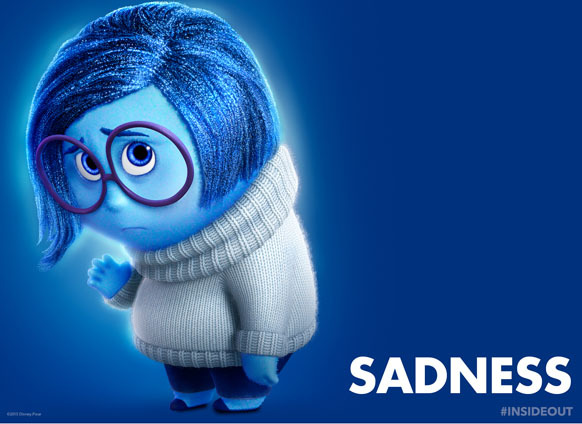 “The real star of the film is sadness, for Inside Out is a film about loss and what people gain when guided by feelings of sadness,” the psychologists Eckman and Keltner write. Sadness, tears and the emotion of awe I felt about this movie led me to share the experience with my mom, an intelligent, sensitive soul, but someone I have a hard time showing emotion to. But for the second time seeing Inside Out in a theater, I cried in front of her—a lot and for the first time in years. That was my own fifth lesson.